Andrew Gillum, the socialist Democratic gubernatorial candidate from Florida, has officially lost the race to Republican candidate Ron DeSantis. Some of Gillum's most ardent supporters say that he lost because he's black and Florida's voters are racist. These same people forget that Barack Obama, America's first black president, won the state twice in 2008 and 2012. According to the Tampa Bay Times, folks like Judy Beck are positive that had Gillum been a different skin color, then he would have won the race. "Andrew Gillum would have won if he were white," said Beck, a St. Petersburg retiree and registered Democrat. Even a state senator, Darryl Rouson, D-St. Petersburg, claim the election came down to racism. This narrative falls apart though when looking at simple exit polls from the election. 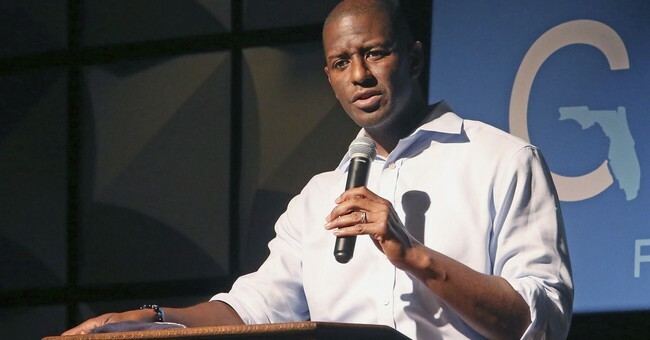 If white people voting against Gilum due to his skin color were to blame for his failure, then how do these Democrats explain the voting behavior of Florida's black population. As noted by the Tampa Bay Times, "Exit polls showed 86 percent of black voters cast ballots for Gillum, and 90 percent backed Nelson. At least 95 percent of black voters backed Barack Obama 2008 and 2012." President Barack Obama beat white Republican candidates John McCain and Mitt Romney in 2008 and 2012 respectively. But not every Florida Democrat believes racism played a factor, it was ultimately Gillum's far-left politics according to some. Still, the left loves to claim racism even when it simply isn't true. While it's no longer surprising liberals resort to this attack, it is worth keeping in mind exactly why they do it. The late-great Andrew Breitbart explains why the "Race Card" is so powerful in CL Bryant's documentary "Runaway Slave." "One of the most effective tactics that the left has is the ability to accuse its opponents of being a racist. It's an impossible negative to dispel. It immediately puts somebody on the defensive and it sends a message to the audience you shouldn't take seriously what's coming out of that person's mouth because they've been degraded as being a racist."